House Fires in Boston: Is your family ready? It’s easy for you to improve fire safety at home. All you have to do is keep an eye on your smoke alarms and make sure your household not only has a fire escape plan, but that everyone knows and practices the plan. According to the City of Boston’s Home Fire Safety page, all of the smoke alarms in your home should be tested at least once a month and you should replace their batteries annually. Each family should also make sure that the fire escape plan is practiced at least twice every year. To help you to remind you of this, officials are soon launching Fire Prevention Week, from October 7th through October 13th. Our Boston personal injury lawyers understand that there are roughly 3,000 people who are killed in residential fires each and every year. Most of the victims in these accidents are killed from the inhalation of toxic gases and smoke and not as the result of any burns from the fire. Most of the fatalities and injuries happen in fires that occur at night while residents are asleep, too! The truth of the matter is that smoke alarms can save lives, they can prevent injuries and they can help to minimize properly damage by helping to make sure that residents are alerted when a fire is developing in the home. The risk of being killed by a fire in your home is about twice as high in a home that does not have a properly-working smoke alarm. Make sure that you always follow the instructions from the manufacturer when testing smoke alarms and replacing the batteries. If your smoke alarm is powered by batteries and it starts to send off a low-power warning, which is usually a beep or a chirp, you’re urged to replace the batteries immediately with new ones. 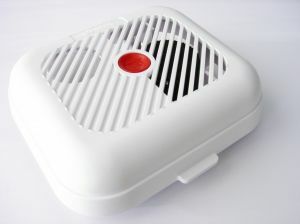 You never want to disable your smoke alarm. This is never acceptable, not even if you experience a “nuisance” from it while showering or cooking. When this happens, you want to clean out the smoke alarm and make sure that you follow the manufacturer’s instructions while doing so. If you can, you might want to place it somewhere else, like away from the bathroom or the kitchen. -Practice your escape plan at least twice a year. -Make sure that children, babysitters and elderly family members are familiar with this plan. -When practicing, remove any obstacles that could hinder a safe evacuation in the event of a real emergency. -Parents should hold a practice fire drill at night to make sure that children are able to wake up during the real thing. When changing the batteries in your home’s smoke alarm, it’s also a good idea to change the batteries in the Carbon Monoxide (CO) alarm, too! CO is an odorless, colorless gas that is created when fuel is incompletely burned. Each year, there are close to 200 people who are killed from CO, non-fire poisonings that are associated with home fuel-burning heating equipment. If you or someone you love has been injured, contact Injury Attorney Jeffrey S. Glassman for a free and confidential consultation to discuss your case. Call 877-617-5333.